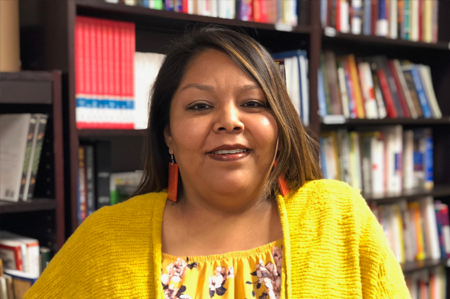 Kerlissa Bitah has been selected as the 2018 Navajo Nation First Things First Champion for Young Children. Hosting community activities focusing on early childhood and kindergarten readiness, such as the inaugural Celebrating Fatherhood Event at T’iis Nazbas Community School. Inviting and establishing partnerships with other programs in the community to work toward common goals prioritizing early childhood and early literacy, including organizing and hosting Early Childhood Every Day Trainings for community partners and organizations. Hosting Yearly Child Find events at T’iis Nazbas Community School. Advocating for early childhood initiatives among other partner organizations, workplace, community, and surrounding communities, such as including Early Childhood messaging and engagement during community trash pick-up day. 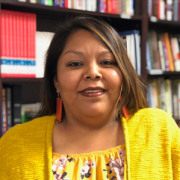 Regularly attending and/or convening coalitions, such as her Community Connections group, where she encourages the group to conduct community activities focused on early childhood, and being an active member of the Navajo Nation Early Childhood Coalition. Traveling to Cuba for outreach efforts and ideas for service and program implementation regarding little ones within her home community. Both trips allowed her to learn more about early childhood health initiatives in Cuba and use that inspiration within the Family and Child Education (FACE) Program. Tabling on behalf of First Things First to promote early childhood and early literacy at community events throughout the region. We recently caught up with Bitah, who is a teacher and coordinator at T’iis Nazbas FACE Program. Question: Why do you feel early childhood development and health is so important? Answer: Many studies show health disparities are related to education, environmental factors, individual social behaviors, and poverty. Early childhood development gives an opportunity for a child and their family to have success to combat some of these health disparities. It is also important for the individual child to enhance their learning and socialization while providing an identity and value to a child’s life. Early learning often becomes the foundation of their life. Early childhood programs out there serve this purpose – to educate and hopefully prevent. So we, as parents, are responsible for our child’s well-being, and that includes education and health. Babies begin to learn about the world around them from a very early age. Children’s early experiences also have an effect, such as the bonds they form with their parents and their first learning experiences. Heightening the early years of children’s lives is the best investment we can make in guaranteeing their future success. The emotional, social and physical development of young children has a direct effect on their overall development and on the adult they will become. Question: How do you suggest other people in your community get involved? Answer: The problems that persist within our communities are issues that can be addressed with preventive measures by educating our families who live in our communities. Diabetes, obesity, infectious diseases and human error accidents are all preventive through education. We should all have goals to better ourselves and our children, this all starts at the home. Involvement is the starting pointing. The child always follows the parent and learns. So being involved at home will provide a good foundation of success. Parents modeling good behavior often correlates to the child’s behavior at school. If families provide healthy food at home, our children will gain nourishment needed for healthy living. If we volunteer or involve ourselves with community events then our children will follow too. Values learned at home provide a guide for a child’s life. So if we value our land, our culture or our health then we need to take care of it by getting involved. Good family involvement will provide adequate community involvement.